Background and Objectives: Water and sanitation are major public health issues exacerbated by rapid population growth, limited resources, disasters and environmental depletion. This study was undertaken to study the influencing factors for household water quality improvement for reducing diarrhoea in resource-limited areas. Materials and Methods: Data were collected from articles and reviews from relevant randomized controlled trials, new articles, systematic reviews and meta-analyses from PubMed, World Health Organization (WHO), United Nations Children's Fund (UNICEF) and WELL Resource Centre For Water, Sanitation And Environmental Health. Discussion: Water quality on diarrhoea prevention could be affected by contamination during storage, collection and even at point-of-use. Point-of-use water treatment (household-based) is the most cost-effective method for prevention of diarrhoea. Chemical disinfection, filtration, thermal disinfection, solar disinfection and flocculation and disinfection are five most promising household water treatment methodologies for resource-limited areas. Conclusion: Promoting household water treatment is most essential for preventing diarrhoeal disease. In addition, the water should be of acceptable taste, appropriate for emergency and non-emergency use. Diarrhoea is commonly linked to water and sanitation. About 4 billion cases annually account for 5.7% of the global burden of disease with diarrhoeal disease as the third highest cause of morbidity and sixth highest cause of mortality. Generally, safe water is important in preventing diarrhoeal diseases. For promoting safe water supply, the World Health Organization (WHO) sets guidelines for water quality, which express no detectable level of pathogenic organism in the water intended for human consumption. However, it is not always possible to follow standard guidelines for water quality. Furthermore, waterborne pathogens can also be transmitted via ingestion of contaminated food and other beverages, by person-to-person contact and by direct or indirect contact with infected faeces. There is an immediate need for resource poor communities to innovatively develop cost effective water treatment methodology before universal water supply and safe water pipe is provided. This study reviewed the impact of different water sanitation programmes in reducing diarrhoea morbidity and mortality. Further analysis was extended to identify household water treatment in preventing diarrhoea and health impact. Relevant literature was obtained through a rigorous search from databases of the WHO, World Bank, UNICEF, Cochrane Library, PubMed, Medline, EMBASE, Water, Sanitation and Hygiene and WELL Resource Centre. All studies relating to water quality, diarrhoea, household water treatment, and hygiene and sanitation were searched. After reviewing titles, 316 studies between 1980 and 2011 were reviewed for abstract. Finally 31 articles were selected. Studies from developing countries were given priority in this review. All the studies collected were reviewed, collated, categorized and reported for all relevant and important findings. (i) Water quality and quantity (two rigorous studies) (17%); (ii) Water quality (four rigorous studies) (15%); (iii) Water quantity (five rigorous studies) (20%); (iv) Water and sanitation (two rigorous studies) (30%); (v) Hygiene (six rigorous studies) (33%) and (vi) Sanitation (five rigorous studies) (36%). 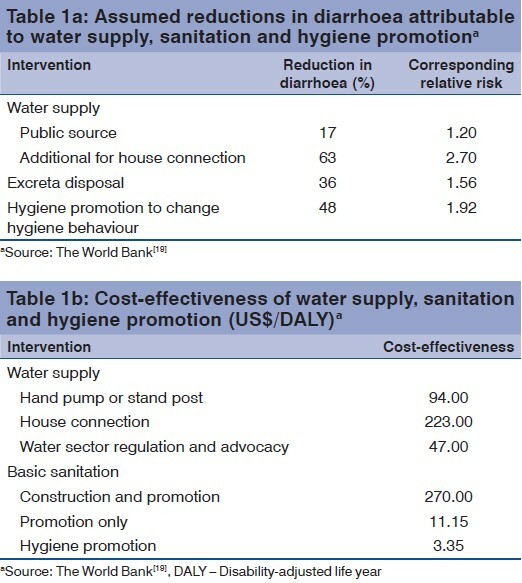 However, better evidence for water quality was found in the World Bank report [Table 1] indicating water supply with house connection has a 63% reduction in diarrhoea and 2.7 relative risk. In another finding, water collection distance is also important for fullest use of water. In [Figure 1], Caincross and Feachem  showed that household water consumption declined to less than half of connected households at more than 5 minutes water collection distance. In this review, we explored and identified water quality including different water treatment methods affecting diarrhoea morbidity and mortality. Some findings show that household-based approaches to water treatment may be more efficient and cost-effective means of preventing diarrhoeal disease than conventional treatment at the source. Household-based chlorination is the most cost-effective method followed by solar disinfection, which is only slightly less cost-effective. Conventional source-based interventions have a mean cost per disability-adjusted life year (DALY) averted of about twice that of chlorination and solar disinfection. In Africa (high adult and high child mortality region), the cost per DALY averted by household chlorination is US$46, by household solar disinfection is US$54, by source-based interventions is US$106, by household ceramic filtration is US$125 and by household flocculation/disinfection is US$415 [Appendix 1]. [Additional file 1] However, the study reviewed endemic diarrhoea only and also could not include economic value of other benefits (including time savings) or diseases related to unsafe water such as typhoid, hepatitis A and E and polio. Those diseases are transmitted by the ingestion of unsafe water and food but their pathology does not consist of diarrhoea. 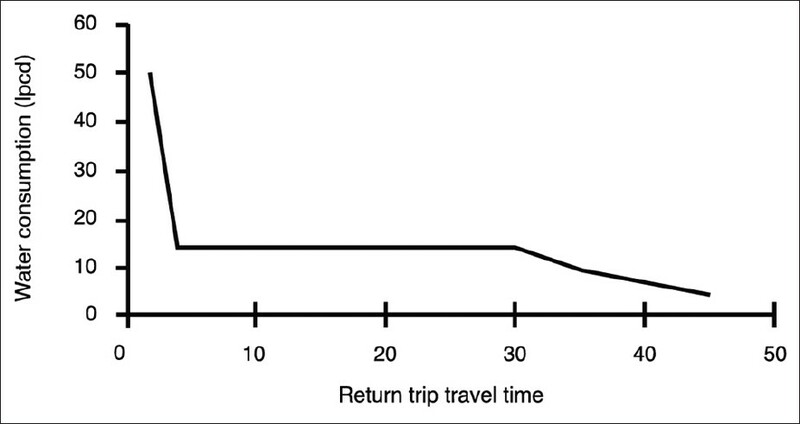 In addition, according to the Caincross model,  household water consumption declined to less than half of connected households at more than 5 minutes water collection distance, no change between 5 and 30 minutes and reduced again after more than 30-minute distances. Calculating benefit and quality improvement of water; equity in access and social disparity are additional dimensions to be considered. In almost three-quarters of households without access to drinking water on premises, women and girls have the primary responsibility for collecting water; in some countries the proportion is more than 90%. This is a very significant burden for women, especially when the time taken to collect water is considerable. Diarrhoea, acute or persistent, is a broad term and effect of household water treatment should be analysed in comprehensive health impact. Accordingly, health impact of treating water at the point of consumption is not absolute. Except in the case of Vibrio cholerae, point-of-use water quality or a reduction in waterborne pathogens is not clearly associated with a reduction in diarrhoea. Many studies could not produce consistent protective effect of water treatment; more than two dozen studies have shown household water treatment to be protective for diarrhoea but the range of effects is quite broad. Furthermore, one of the only blinded trials by Kirchoff et al.,  has not demonstrated any statistically significant reduction in diarrhoea. Those heterogeneous results from various interventions may possibly be related to a wide range of conditions such as diverse risk settings, the different methodological rigour of the studies, negative externalities from unhygienic practices and other socioeconomic factors. Treating water at the point-of-use, household water treatment is the best option for the resource-limited area. The WHO is exploring effectiveness in improving and maintaining microbial water quality, health impact, simplicity, accessibility, cost, acceptability, sustainability and potential for dissemination. The studies were further reviewed by Thomas,  who reported the five most promising household water treatments. It is most common at the community level and in emergency. Liquid sodium hypochlorite or solid calcium hypochlorite is commonly used and mostly affordable methodology. At doses of a few milligrams/litre and contact time of about 30 minutes, free chlorine inactivates more than four logs of enteric pathogens, the notable exceptions being Cryptosporidium and Mycobacterium species. Higher quality ceramic filters treated with bacteriostatic silver. Bio-sand filter (Manz intermittent slow sand filter). Boiling or heat treatment of water is most effective against the full range of microbial pathogens. Similarly, solar disinfection by using thermal and ultra violet (UV) radiation reduce diarrhoeal morbidity of attributable risk fraction by 16% among children. Treatment of water with solar radiation was practiced in ancient India for more than 2000 years ago,  which controls waterborne microbial contaminants by exposure to sunlight. The 'SODIS' system, developed and promoted by the Swiss Federal Institute for Environmental Science and Technology treat low turbidity (<30 NTU) water in clear plastic bottles through aerating to increase oxygenation and exposing the bottles to the sun. Exposure times vary from 6 to 48 hours depending on the intensity of sunlight. Thermal and solar disinfection does not provide residual protection against recontamination. However, prevalence of such appropriate household water treatment methodologies is not very common in developing countries. Generally, practices like straining water through a cloth or letting it stand and settle are not considered appropriate methods. There is a need for appropriate strategies to scale up to poorer households. Beyond the importance of methodological complexity, additional factors are needed to achieve full utilization of household water treatments by communities. Accessibility, taste and quality of water are the most important factors. Public-private partnership (PPP) and social marketing will be further options for promoting household water treatment. Supporting private sector and local small and medium enterprise for the promotion of household water treatment could be the sustainable solution for resource-limited communities. Currently, five types of household water treatment methods are most effective and applicable to rural and resource-limited settings and areas where water is unable to be universally piped in. Regarding requirements of proper utility and storage methods related with human behaviour, we recommend further research about household water treatment among rural populations. While there is considerable research to support the microbiological effectiveness and promising, although not definitive health impact, there is relatively little evidence about the potential uptake of such interventions. Acceptability, affordability, long-term utilization and sustainability need further exploration, particularly in programmatic settings. Moreover, hardware development will have an exponential impact when there is software for changing people's behaviour and acceptance. The possible policy option for promoting behaviour and acceptance among communities is social marketing through PPPs. The private sector has advantages in marketing and mobility to reach communities. Quality assurance by various research of the public sector can be assisted by private sector assistance in marketing and promotion of utility. Promoting household water treatment is most essential in preventing diarrhoea disease and reducing diarrhoea death among patients. Although there are different methodologies so far, issues such as taste and quality (most acceptable), appropriateness to all situations (both emergency and non-emergency) and costing (affordability) will ultimately help to determine the potential role of household water treatment in preventing diarrhoea. 1. Prüss-Üstün A, Bos R, Gore F, Bartram J. Safer water, better health: Costs, benefits and sustainability of interventions to protect and promote health. Geneva: World Health Organization; 2008. 2. World Health Organization. How does safe water impact global health. Geneva: WHO, 2008. Available from: http://www.who.int/features/qa/70/en/index.html [Last accessed on 2012 May 15]. 3. Thomas C. Household water treatment. Quality assurance: Sandy Caincross. WELL Fact Sheet. January; 2005. 4. World Health Organization. Guidelines for drinking-water quality. 3 rd ed. Geneva: 2008. p. 48-144. 5. United Nation. General Assembly declares access to clean water and sanitation is a human right. UN News Centre, 2010. Available from: http://www.un.org/apps/news/printnewsAr.asp?nid=35456 [Last accessed on 2013 May 15]. 6. World Health Organization. Global health observatory: use of improved drinking water sources: situation and trends. Geneva: WHO. Available from: http: www.who.int/gho/mdg/environmental_sustainability/water_text/ [Last accessed on 2013 May 15]. 7. World Health Organization. Health and millennium development goal. Geneva: WHO; 2005. p. 12-30. 8. United Nations Centre for Human Settlement. An urbanising world: Global report on human settlements 1996. Oxford: Oxford University Press; 1996. p. 263-28. 9. Guy H, Jamie B. Global costs of attaining the Millennium Development Goal for water supply and sanitation. Bull World Health Organ 2008;86:13-9. 10. World Health Organization/UNICEF. Drinking water equity safety and sustainability: Thematic report on drinking water 2011. Geneva: WHO-UNICEF; 2011. 11. Esrey SA, Potash JB, Roberts L, Shiff, C. Effects of improved water supply and sanitation on ascariasis, diarrhoea, dracunculiasis, hookworm infection, schistosomiasis, and trachoma. Bull World Health Organ 1999;69:609-21. 12. Caincross S, Feachem R. DFID guidance manual on water supply and sanitation programmes. Loughborough: WELL for DFID; 1993. p. 63-77. 13. Thomas FC, Laurence H. Water quality interventions to prevent diarrhoea: Cost and cost-effectiveness. Geneva: World Health Organization; 2008. p. 1-17. 14. Fewtrell L, Kaufmann R, Kay D, Enanoria W, Haller L, Colford JM Jr. Water, sanitation, and hygiene interventions to reduce diarrhoea in less developed countries: A systematic review and meta-analysis. Lancet Infect Dis 2005;5:42-52. 15. Waddington H, Snilstveit B, White H, Fewtrell L. Water, sanitation and hygiene interventions to combat childhood diarrhoea in developing countries. International Initiative for Impact Evaluation, 2009. Available from: http://www.indiawaterportal.org/sites/indiawaterportal.org/files/3ie_systematic_review_download.pdf [Last accessed on 2013 May 31]. 16. World Health Organization. The world health report 2002. Geneva: WHO; 2002. p. 101-44. 17. Gundry S, Wright J, Conroy R. A systematic review of the health outcomes related to household water quality in developing countries. J Water Health 2004;2:1-13. 18. Quick RE, Venczel LV, Mintz ED, Soleto L, Aparicio J, Gironaz M, et al. Diarrhoea prevention in Bolivia through point-of use water treatment and safe storage: A promising new strategy. Epidemiol Infect 1999;122:83-90. 19. Caincross S, Valdmanis V. Disease control priorities in developing countries. 2 nd ed. Washington DC; 2006. p. 771-29. 20. Kirchhoff LV, McClelland KE, Do Carmo Pinho M, Araujo JG, De Sousa MA, Guerrant RL. Feasibility and efficacy of in-home care chlorination in rural North-eastern Brazil. J Hyg (Lond) 1985;94:173-80. 21. Dunne EF, Angoran-Benie H, Kamelan-Tano A, Sibailly TS, Monga BB, Kouadio L, et al. "Is drinking water in Abidjan, Cote d′Ivoire, safe for infant formula?" J Acquir Immune Defic Syndr 2001;28:393-8. 22. Iroegbu CU, Ene-Obong HN, Uwaegbute AC, Amazigo UV. Bacteriological quality of weaning food and drinking water given to children of market women in Nigeria: Implications for control of diarrhoea. J Health Popul Nutr 2000;18:157-62. 23. Luby SP, Agboatwalla A, Raza J, Sobel J, Mintz ED, Baier K, et al. Microbiologic effectiveness of hand washing with soap in an urban squatter settlement, Karachi, Pakistan. Epidemiol Infect 2001;127:237-44. 24. Echeverria P, Taylor DN, Seriwatana J, Leksomboon U, Chaicumpa W, Tirapat C, et al. Potential sources of enterotoxigenic Escherichia coli in homes of children with diarrhoea in Thailand. Bull World Health Organ 1987;65:207-15. 25. Knight SM, Toodayan W, Caique WC, Kyi W, Barnes A, Desmarchelier P. Risk factors for the transmission of diarrhoea in children: A case-control study in rural Malaysia. Int J Epidemiol 1992;21:812-8. 26. Deb BC, Sircar BK, Sengupta PG, De SP, Mondal SK, Gupta DN, et al. Studies on interventions to prevent eltor cholera transmission in urban slums. Bull World Health Organ 1986;64:127-31. 27. Swerdlow DL, Mintz ED, Rodriguez M, Tejada E, Ocamp C, Espejo L, et al. Waterborne transmission of epidemic cholera in Trujillo, Peru: Lessons for a continent at risk. Lancet 1992;340:28-33. 28. Welch P, David J, Clarke W, Trinidade A, Penner D, Berstein S, et al. Microbial quality of water in rural communities of Trinidad. Rev Panam Salud Publica 2000;8:172-80. 29. Sobsey MD. Managing water in the home: accelerated health gains from improved water supply. Geneva: World Health Organization, 2002. Document No. WHO/SDE/WSH/02.07. 30. Conroy RM, Meegan ME, Joyce T, McGuigan K, Barnes J. Solar disinfection of water reduces diarrhoeal disease: An update. Arch Dis Child 1999;81:337-8. 31. Reller ME, Mendoza CE, Lopez MB, Alvarez M, Hoekstra RM, Olson CA, et al. A randomized controlled trial of household-based flocculant-disinfectant drinking water treatment for diarrhea prevention in rural Guatemala. Am J Trop Med Hyg 2002;69:411-9.